The more I stare at this list, the more I think to myself..."I must have all of these things." And then I enter this dark hole of online shopping mania where suddenly I'm filling up carts with all these nice things I want, only to x-out of all the tabs and walk away from my computer with nothing. Sometimes it seems like some sort of therapy to sort out my Pinterest-filled head of useless artifacts to throw around my home and all over my body. Or useless artifacts that will end up covered in Bubba's pee. But regardless, here I am, craving away and wondering why I didn't include a Wendy's spicy chicken sandwich on this list. Because right now, that would be dope. Ahh, I love envelope clutches. Part of my now-and-forever-on-the-backburner clothing line was a ton of them. It's a pain because I can't fit my camera in them, but whatever. They're pretty! 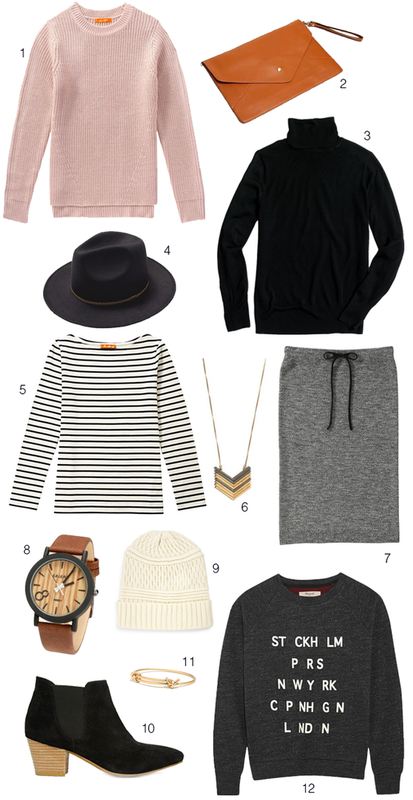 cute picks, love that last sweatshirt! Um, #1, I am exactly the same way. #2, did I feel like I waste my time doing it? Absolutely not. #3, I have a million pinterest boards because I over-categorize. *whew* it's hard being me sometimes.